Send your gift recipient on a tour of the world's great vineyards with this single bottle wine gift that features one recent Wine of the Month Club Selection. Our exceptional wines have been hand-picked from among the hundreds of wines tasted and compared by Cellarmaster Paul Kalemkiarian each month. 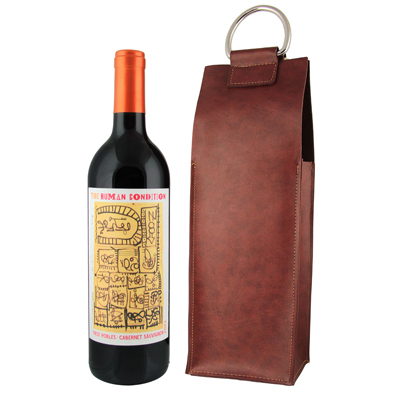 Inspired by travel from city to bustling city, our chestnut-colored faux leather wine bottle bag replaces flimsy bottle bags with something that will stand up to a tireless lifestyle. Featuring a magnetic closure and two sturdy metal handles.